0. If you had to pick one person in the 20th century who irreversibly changed the world, who would it be? It was just a primary — and the results aren’t even final yet, with mail-in ballots still being counted to determine if there will be a runoff. But advocates for traditional public education are jubilant that Bill de Blasio came out on top Tuesday in the Democratic mayoral race in New York City after a campaign in which he promised to yank support from charter schools, scale back high-stakes standardized testing and tax the wealthy to pay for universal preschool and more arts education. De Blasio’s education platform boiled down, in effect, to a pledge to dismantle the policies that Mayor Michael Bloomberg enacted over the past decade in the nation’s largest school district. Those policies, emphasizing the need to inject more free-market competition into public education and weaken the power of teachers unions, are not unique to New York City; they’re the backbone of a national education reform movement that has won broad bipartisan support. Yet the reform movement has also triggered a backlash from parents and teachers who see it as a threat to their schools, their jobs and the traditional concept of public education as a public trust. Following this Labor Day weekend, virtually all of the nation’s students in grades K-12 will be back in school. Unfortunately, fewer of them will be participating in physical education classes and intramural sports programs. It’s mind-boggling that at a time when overweight and obesity levels are sky-high among our young people, and physical activity levels are down, our schools are cutting physical education classes, recess and intramural sports programs. Due to No Child Left Behind mandates and the pressures of standardized state assessment tests, many schools are cutting back on physical education and recess under the mistaken belief that kids need more desk time to improve test scores. Based on the latest research on exercise and the brain, that’s the direct opposite approach that schools should be taking. “Overall, I don’t think there’s any doubt that schools are feeling pressure from No Child Left Behind and standardized tests,” according to Brenda VanLengen, Vice Chair of PE4life, a physical education advocacy organization. Links: A recent Wisconsin State Journal Evers endorsement. Three weeks from today, Wisconsin voters will decide who will oversee K-12 public education for the next four years. Incumbent state Superintendent Tony Evers faces a challenge from Republican state Rep. Don Pridemore. Evers says he’s proud of his accomplishments over the past four years. He highlights the implementation of Common Core Standards. The national initiative sets benchmarks for students to meet in English, Language Arts and Math, to make sure they’re prepared for the workforce. “We’re developing new assessment systems and accountability systems. We have a new reading screener we’ve implemented at kindergarten that’s been very good as far as providing information for classroom teachers to intervene early,” Evers says. Evers says his biggest challenge has been competing with choice or voucher schools for state funding. Students in Milwaukee and Racine can attend private schools – taking with them, the tax money that would have gone to the public system. Evers opposes Gov. Walker’s plan to expand the voucher program to nine more school districts and increase funding for participating students. “There’s a zero dollar increase for our public schools per pupil and then on the voucher side there’s a $1,400 per student increase for $73 million. To me that’s a concept that isn’t connected in any good way for our public schools,” Evers says. Evers opponent, Republican Rep. Don Pridemore of Hartford supports the expansion of choice. He says there would not to be need for it, if public schools better prepared students. Pridemore says if he’s elected, he’ll work to expand the program statewide. Four years ago the State Journal editorial board worried that Tony Evers would “be a spokesman for the status quo” if elected state superintendent of schools. Evers has distinguished himself during these hyper-partisan times as a leader who cares more about results for Wisconsin schools and students than he does politics or publicity. The State Journal strongly endorses his re-election April 2. 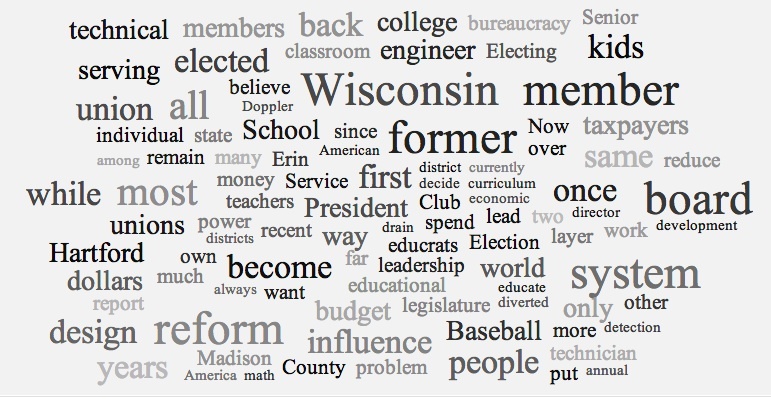 Like most of the educational establishment, Evers opposed Republican Gov. Scott Walker’s big cut in state aid to public schools coupled with strict limits on collective bargaining for teachers. Last week, Senate Democrats lashed out at a Republican bill they said was intended to weaken the already enfeebled Office of the Secretary of State, currently held by Democrat Doug La Follette. “It’s directed to take the one Democrat elected to statewide office and cut him out of the legislative process,” state Sen. Fred Risser, D-Madison, says of the legislation, which would remove the secretary of state’s ability to delay the publication of a bill for up to 10 days after passage, as La Follette did following the controversial passage of Gov. Scott Walker’s collective bargaining bill two years ago. Technically, Risser is correct. The secretary of state, which Gov. Tommy Thompson long ago relegated to obscurity, is the only statewide office held by Democrats. But while the superintendent of public instruction is technically a nonpartisan position, current Superintendent Tony Evers, like his predecessors for the past 30 years, is supported by Democratic-affiliated groups and has been an outspoken opponent of many of Walker’s policies. And unlike La Follette, Evers has a meaningful platform to influence one of the most important issues facing the state. It’s noteworthy, then, that Evers does not seem to be a significant target for conservatives, even though his lone challenger in the April 2 election for another four-year term is a GOP member of the Assembly: Don Pridemore. State Superintendent Tony Evers on Monday reintroduced a proposal from two years ago to increase state funding for public education and change the way the state finances its public schools as part of his 2013-’15 budget request. The proposal calls for a 2.4% increase in state aid in the first year of the budget and a 5.5% increase in 2014-’15, which Evers said would put the state back on track to return to two-thirds’ state support for public school costs by 2017. The Department of Public Instruction’s 2013-’15 budget proposal guarantees state funding of $3,000 per pupil and would result in every school district either getting more state money or the same money as before, but Republican legislators on Monday did not express confidence in the total package. Luther Olsen, chair of the Senate Education Committee and a Republican from Ripon, said Evers’ “Fair Funding for our Future” plan just shifts money around between districts and doesn’t really award more money to schools. Olsen did say he would like to increase districts’ revenue limit authority per student – or the combined amount they can raise in state general aid and local property taxes – by at least $200 per pupil starting in the first year of the next biennial budget. Evers announced his 2013-’15 state public education budget request Monday at Irving Elementary School in West Allis. Walker spokesman Cullen Werwie said the proposal will be reviewed in the context of the overall budget, but said education is one of Walker’s top budget priorities. “The governor will work to build off of the work done with Superintendent Evers on school district accountability and Read to Lead as he creates the first version of the state budget, which will be introduced early next year,” Werwie said. Evers also said he’ll run for re-election next year, adding that despite the funding cuts, he’s excited to continue pushing reform and accountability. Various conservative education sources said no candidate has come forward to challenge Evers yet, but talks were ongoing with potential challengers. Nomination papers can be circulated Dec. 1 and are due back to the GAB Jan. 2. Still, Kestell said $7 million was a lot, and probably would not have been considered at all two years ago when the state made significant cuts to education spending. The DPI’s Johnson pointed to Milwaukee Public Schools as a model district that has begun ACT testing for all juniors, setting aside time for them to take the four-hour exam in school. Though testing all juniors has lowered the district’s average ACT composite score, the move has received praise for opening opportunities to more students who may not have known they were ready for college, and for providing a broader measure of student performance. Wisconsin would pay for all public high school juniors to take the ACT college admissions test starting in two years as part of a $7 million budget initiative State Superintendent Tony Evers announced Wednesday. The proposal also includes administering three other tests offered by ACT to measure college and career readiness in high school. The tests would replace the Wisconsin Knowledge and Concepts Examination, which is currently administered to 10th-graders to comply with federal testing requirements. Under the proposal, all public school ninth-graders would take the ACT EXPLORE assessment in spring of the 2014-15 school year. All 10th-graders would take the ACT PLAN test, and all 11th-graders would take the ACT and the WorkKeys tests. The state would pay for students to take each test once. Those who want to take an ACT a second time to improve their score would have to pay for it themselves. Also, by training all schools to administer the ACT, the proposal would help students in rural districts who lack access to certified ACT testing sites, Evers said. Much more on the oft-criticized WKCE, here. The proposed amendment text would make the “rights” to organize and bargain collectively a constitutional guarantee, and any state law that would “abridge, impair or limit” collective bargaining would be repealed. Last Monday, the Michigan court of appeals ruled that the measure could appear on the ballot, and the state Supreme Court heard arguments on the case Thursday. The problem is that the amendment language is so broad that the courts could interpret any union-related measure as a violation. It explicitly refers to all current and future laws. In 1997, for instance, Michigan moved new state employees to a defined-contribution pension from a defined-benefit plan. If the amendment passes, unions will challenge the new plan as unconstitutional and it could be invalidated at a cost of hundreds of millions of dollars a year. Clusty Search: Michigan “Protect Our Jobs” Amendment. Given crucial assumptions, b1 is the private return to education. I’ve discussed some of these crucial assumptions elsewhere. One that I’ve neglected, though, is the possibility of reverse causation. 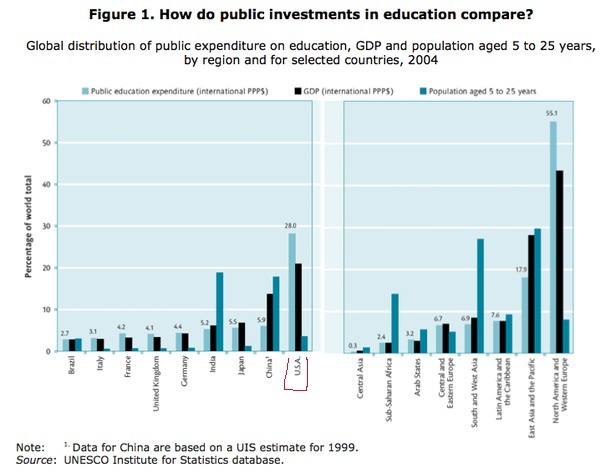 Maybe higher income (or the expectation of higher income) leads to more education in the same way that higher income leads to more plasma TVs: you buy not as a prudent investment, but because the money’s burning a hole in your pocket. If so, b1 overestimates education’s private rate of return. An education reform bill circulating this week would require kindergarten screening exams and teacher evaluations based partly on test scores, but doesn’t update the state’s system for holding schools accountable for student performance. The omission concerned State Superintendent of Public Instruction Tony Evers, who for the past year has worked with Gov. Scott Walker on three bipartisan task forces addressing literacy, teacher effectiveness and school accountability. The bill includes recommendations from the first two groups, but not the third. Specifically, the bill doesn’t propose changes that would bring charter schools and private voucher schools under the new accountability system, or update language in state law related to No Child Left Behind. Evers said the bill misses an opportunity to deliver action on promises made by Walker, legislators and education leaders, including advocates for charter and private voucher schools. The DPI has much to answer for after the millions spent (and years wasted) on the oft-criticized WKCE. The first decade of the 21st century does not exhibit the same trend. Based on the most recent IRS data, from 2009, income inequality has fluctuated considerably since 2000 but is now at about the level it was in 1997. Thus, the Bush-era tax cuts (which had provisions benefitting both high- and low-income taxpayers) did not lead to increased income inequality. 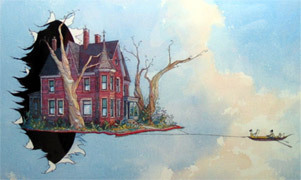 By contrast, inequality rose 12 percent between 1993 and 2000, following two tax rate increases on high-income earners. Thus, changes in inequality over the last two decades appear to be driven more by the business cycle than by tax policy. It took nearly a year for Dale Kleinert to negotiate his first teachers’ contract. When Kleinert started his job as schools superintendent in Moscow, Idaho, the talks were already underway. Then, discussions reached an impasse. There were disagreements over pay and health care costs, and the pace slowed further when first an outside mediator and later a fact-finder didn’t render a decision. It wasn’t until May of 2011 that Kleinert and his union counterparts finally reached an agreement. Just before then, while Kleinert and the teachers were still stuck, Republican lawmakers in Boise were finishing work on plans to take away much of the leverage that Idaho teachers had long enjoyed in these kinds of negotiations. So for Kleinert’s next round of talks with Moscow’s teachers, which began pretty much right after the previous ones wrapped up, the rules were very different. Workplace mentors used to be older and higher up the ranks than their mentees. Not anymore. In an effort to school senior executives in technology, social media and the latest workplace trends, many businesses are pairing upper management with younger employees in a practice known as reverse mentoring. The trend is taking off at a range of companies, from tech to advertising. The idea is that managers can learn a thing or two about life outside the corner office. But companies say another outcome is reduced turnover among younger employees, who not only gain a sense of purpose but also a rare glimpse into the world of management and access to top-level brass. Evers spoke during a conference call with U.S. Education Secretary Arne Duncan shortly after President Barack Obama announced that he was allowing states to seek the waivers. “This is absolutely outstanding news,” said Evers, who has long advocated for states to be given the ability to get out of meeting some parts of the law. Obama is allowing states to scrap the hugely unpopular requirement that all children must show they are proficient in reading and math by 2014 if states can meet conditions designed to better prepare and test students. Education chiefs from more than 20 states gathered at the White House on Friday morning to hear President Barack Obama formally propose relaxing certain tenets of the No Child Left Behind act for states that agree to meet a new set of standards he called more flexible. In characterizing the nearly 10-year-old act as too rigid, the president appeared to strike a chord with school administrators across the country. How much enthusiasm his solution will generate remains to be seen. It calls for evaluating teachers in a way that wouldn’t be legal in California, for example, a state that very much supports amending the No Child Left Behind Act. I spoke with a local mother recently who mentioned that her child was doing great, based on the WKCE math report. Reforming Wisconsin education Gov. Scott Walker and state schools superintendent Tony Evers should be inclusive in their efforts. 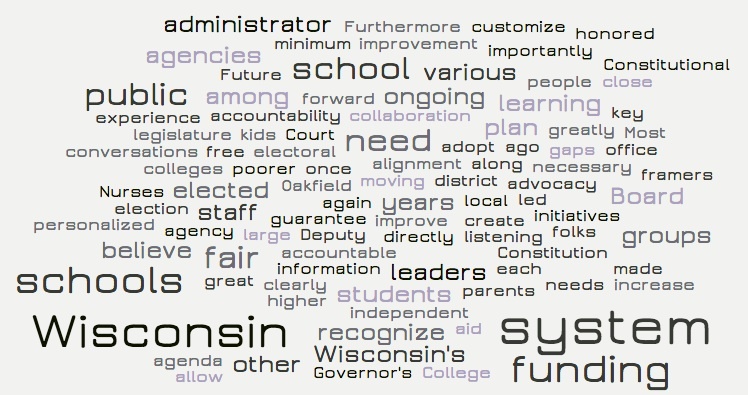 Creating a new system of accountability for schools in Wisconsin could be a great help to parents and school districts and, thus, an important educational reform for the state. If the new system is fair and done right, it would provide plenty of clear information on which schools are achieving the right outcomes. Ideally, it would measure schools not only on whether they have met certain standards but how much students and schools have improved over a certain time period. It also would measure all schools that receive public funding equally – public, charter and voucher – so that families would have the information they need to make good choices. That’s all important. Gov. Scott Walker, state schools superintendent Tony Evers and others have signed on to create a new school accountability system and to seek approval from the U.S. Department of Education to allow the system to replace the decade-old, federally imposed one they say is broken. The feds should give that approval, and the state should move forward with this reform and others. About a dozen members of a bipartisan, mostly volunteer organization called Common Ground file into Superintendent Tony Evers’ utilitarian conference room in downtown Milwaukee. The group is exploring how to help Milwaukee’s beleaguered schools, and it has scheduled a meeting with the head of the Wisconsin Department of Public Instruction as part of its research. Tall, thin and gray haired, Evers has a boyish smile and a welcoming manner. He’s now in a white shirt and tie, sans the suit coat he wore to an earlier meeting with suburban school officials in Pewaukee. Common Ground, a nonpartisan coalition that includes churches, nonprofits and labor unions, has come to Evers’ office today looking for advice on how best to direct its considerable resources toward helping Milwaukee students, whose performance in both traditional public schools and in taxpayer-funded voucher schools ranks at the bottom of major American cities. How does Wisconsin compare to other states and the world? Learn more at www.wisconsin2.org. I hope you enjoyed a few days off after a busy year. To the normal craziness of spring, you probably had the heartache of considering budget cuts and layoffs. You probably work in a state and district that imposes a lot of constraints on your hiring, curriculum, materials, school hours, and facilities. After food and transportation, if your district takes more than 5% for administration your kids are getting shorted. 1) Culture: the behavior you model, the tone of your communications, and the way you deal with challenges shape the culture of your school community. 2) Goals: the way you describe and champion learning expectations for your students and goals for your staff may be your most important role. The habits of mind that you encourage could shape student thinking for decades. State Superintendent Tony Evers [SIS link] in a memo Monday urged the Legislature’s Joint Finance Committee to restore funding for public schools and work collaboratively to improve the quality of all Milwaukee schools before considering any voucher expansion. “To spend hundreds of millions to expand a 20-year-old program that has not improved overall student achievement, while defunding public education, is morally wrong,” Evers said in the memo. Gov. Scott Walker has proposed eliminating the income limits on participating in the Milwaukee Parental Choice Program, eliminating the enrollment cap and has proposed opening up private schools throughout Milwaukee County to accept vouchers from Milwaukee students. Walker has spoken of expanding the voucher program to other urban areas in the state, such as Racine, Green Bay and Beloit. The Milwaukee Parental Choice Program was created to improve academic performance among low-income students who had limited access to high-performing schools. Low-income students use taxpayer money to attend private schools, including religious schools. Each voucher is worth $6,442. The program now is limited to 22,500 students; 20,189 are in the program this year. However, after 20 years and spending over $1 billion, academic performance data and the enrollment history of the school choice program point to several “concerning trends,” Evers said in his analysis of voucher student enrollment, achievement, and projected cost for long-term expansion. Low-income students in Milwaukee Public Schools have higher academic achievement, particularly in math, than their counterparts in choice schools. Evers cited this year’s Wisconsin Knowledge and Concepts exams and the legislatively mandated University of Arkansas study, which showed significant numbers of choice students performing below average on reading and math. At a press conference in Racine, DPI Superintendent Tony Evers gave his harshest criticism of school vouchers yet. Well beyond the typical quibbles over test scores and graduation rates, Evers claimed that school vouchers were de facto “morally wrong.” It’s not every day that a State Superintendent of education accuses an education-reform program of being immoral. In doing so, Tony Evers may have bitten off more than he could chew. Calling a school voucher program morally wrong inculpates more than just the program, it inculpates parents, teachers, organizations, lawmakers, and a majority of Americans that endorse it. In fact, one could reasonably argue that Evers’ statement makes himself morally culpable since Milwaukee’s voucher program operates out of the Department of Public Instruction of which he is the head. What does it say about the character of a man that knowingly administers an immoral program out of his own department? In short, Evers’ argument goes something like this: voucher programs drain public schools of their financial resources; drained resources hurt children academically; hurting children academically is morally wrong; ergo, voucher programs are morally wrong. JFC co-chair Robin Vos, R-Rochester, said in the last budget, cuts to K-12 education were offset by millions of stimulus dollars from the federal government. While he admitted that the “tools” Gov. Walker provides may not offset funding cuts dollar-for-dollar, he said asking teachers to pay more for health insurance coverage and pension will help. Vos then asked Evers if he supports the mandate relief initiatives Walker proposed in his budget. Evers said the mandates, which include repealing the requirement that schools schedule 180 days instruction but retains the required number of hours per school year, won’t generate much savings for school districts. He said the challenge schools face from reduced funding is much greater. “We know that resources are scarce. School districts around the state have demonstrated that they are willing to do their part, both in recent weeks in response to this state budget crisis and throughout the past 18 years under the constraints of revenue caps. While this difficult budget demands shared sacrifice, we need a budget that is fair, equitable, and does not undercut the quality of our children’s education,” Evers said. College Reversal? Studies find a decline in Asian-American students’ success once they move away from home and go to college. 15MB mp3 audio file. Much more on 4k, here. Governor-elect Scott Walker’s campaign promise to lift the enrollment cap on Wisconsin’s voucher and virtual schools could come to fruition soon, despite opposition from unions. In an interview this week on the public affairs program “WisconsinEye,” State Superintendent Tony Evers said that he is open to lifting the enrollment limits, something Republicans have pushed for in the face of resistance from unions and public school advocates who see the voucher program as draining resources from Milwaukee schools by diverting public funding to private voucher schools. Removing the caps on virtual schools or the choice program would not “fundamentally change the way those programs operate, nor will it dramatically increase the enrollments,” Evers said. The greatest challenge facing America’s schools today isn’t the budget crisis, or standardized testing, or “teacher quality.” It’s the enormous variation in the academic level of students coming into any given classroom. How we as a country handle this challenge says a lot about our values and priorities, for good and ill. Unfortunately, the issue has become enmeshed in polarizing arguments about race, class, excellence, and equity. What’s needed instead is some honest, frank discussion about the trade-offs associated with any possible solution. U.S. students are all over the map in terms of achievement (see Figure 1). By the 4th grade, public-school children who score among the top 10 percent of students on the National Assessment of Educational Progress (NAEP) are reading at least six grade levels above those in the bottom 10 percent. For a teacher with both types of students in her classroom, that means trying to challenge kids ready for middle-school work while at the same time helping others to decode. Even differences between students at the 25th and at the 75th percentiles are huge–at least three grade levels. So if you’re a teacher, how the heck do you deal with that? State schools Superintendent Tony Evers (left) says his proposed funding plan is a matter of fairness and transparency. His plan calls for a $420 million funding boost over two years that would allow the state to pitch in at least $3,000 for every student in each district. Evers said the increase would represent the smallest bump in terms of dollars or percent that the department has asked for in the past decade. He disputed accounts that the plan was “dead on arrival” in next year’s Republican-run Legislature and said he’s gotten good response to at least talking about the concept. He said the major concerns so far have been the price tag, but there has been support for the overall policy. Evers said his goal with the plan is to reduce the complexity in the school funding formula, increase transparency in the way schools are funded and “nudge the system” away from using property values as the basis for funding schools. This would ensure that areas with greater concentrations of low-income families receive more funding in their classrooms. However, history shows that this isn’t a winning formula. While students from poorer family backgrounds present challenges in the classroom, greater financial support hasn’t led to better results in Wisconsin. Milwaukee has the highest concentration of free and reduced-price lunch students in the state, as well as one of the highest per-pupil expenditure figures, spending an average of $16,730 per child according to DPI data. Madison, a city with similar low-income population issues, spent $16,393 on each student in 2009. Conversely, other areas dealing with diverse student populations have shown better returns on their educational investments with less expenditure. Wauwatosa and Green Bay have produced more positive results in the classroom despite spending less. The districts spent just $12,098 and $13,041, respectively, per student in 2009. Much more on the proposed changes to State of Wisconsin tax dollars for K-12 Districts, here. Change in education is coming, says State Superintendent Tony Evers – but we can’t tell you exactly what that change will be until after November’s elections. Evers, speaking at his second annual State of Education address last week, discussed the work he’s done in the past year as well as his intentions for the 2010-2011 school year. The address laid out the state’s goals in areas like funding, graduation requirements, teacher certification, and standardized testing. two mp3 audio files, via a kind reader’s email: 30mb. The open enrollment conversation begins at about 19:40 in this first mp3 file and continues in the second (33mb) mp3 file. Much more on outbound open enrollment here. When Mio Honzawa starts fifth grade next April, her textbooks will be thicker. In a move that has divided educators and experts, Japan is going back to basics after a 10-year experiment in “pressure-free education,” which encouraged more application of knowledge and less rote memorization. “I think it’s a good move. Compared to the education I got, I’m kind of shocked at the level my children are receiving,” said Keiko Honzawa, a Tokyo resident and mother of Mio and her seventh-grade brother. As California’s public schools have increasingly poured attention and resources into the state’s struggling students, high academic learners – the so-called gifted students – have been getting the short shrift, a policy decision that some worry could leave the United States at a competitive disadvantage. Critics see courses tailored for exceptional students as elitist and not much of an issue when compared with the vast number of students who are lagging grades behind their peers or dropping out of school. But a growing chorus of parents and advocates is asking the contentious question: What about the smart kids? “We have countries like India, Singapore, China, and they realize the future productivity of their country is an investment in their intellectual and creative resources,” said gifted education expert Joseph Renzulli. Mitch Henck & Don Severson. I am contacting you regarding your Notice of Decision dated February 4, 2010 issued to the Milwaukee Public Schools (MPS) which would potentially eliminate the $175 million in federal funds received for services to low-income children through the Title I program. In your press statement, you indicated that you had a legal responsibility to the children of Milwaukee and that you were using the only tool allowed under state law to ensure these federal funds are used effectively to improve MPS. Not only I am deeply perplexed by the timing of this notice, but I’m equally concemed over the use of your authority to withhold federal dollars to “speed up change” in MPS. I find your efforts to be disingenuous. Clusty Search: Polly Williams, Tony Evers. Via the Milwaukee Drum. Click to listen or download this 27MB mp3 audio file. Much more on the Madison School District’s 4K plans here. I spent Columbus Day in Sunnyvale, fittingly, meeting with a roomful of new arrivals. Well, relatively new. They were Indians living in Silicon Valley. The event was organized by the Think India Foundation, a think-tank that seeks to solve problems which Indians face. When introducing the topic of skilled immigration, the discussion moderator, Sand Hill Group founder M.R. Rangaswami asked the obvious question. How many planned to return to India? I was shocked to see more than three-quarters of the audience raise their hands. Even Rangaswami was taken back. He lived in a different Silicon Valley, from a time when Indians flocked to the U.S. and rapidly populated the programming (and later executive) ranks of the top software companies in California. But the generational difference between older Indians who have made it in the Valley and the younger group in the room was striking. The present reality is this. Large numbers of the Valley’s top young guns (and some older bulls, as well) are seeing opportunities in other countries and are returning home. It isn’t just the Indians. Ask any VC who does business in China, and they’ll tell you about the tens of thousands who have already returned to cities like Shanghai and Beijing. The VC’s are following the talent. And this is bringing a new vitality to R&D in China and India. 24MB mp3. Notes and links on the recent, tentative agreement between the Madison School District and Madison Teachers, Inc. If Mayor Richard Daley walks into your office and tells you to remove your car from his parking space, you will do it. If he sends in one of his flunkeys to tell you to move your bloody car, you will do it. The only distinction between the two requests is how much you grovel, bow, and scrape before doing as you are told. Past Chicago Public School (CPS) CEO, Paul Vallas, walked into the Chicago Teacher Union (CTU) president’s office in 1995 and told her to move her union out of his way because the mayor said so. She did. You would too. That was the whole of Chicago School Reform. It didn’t make any difference at all whether the messenger was Vallas, Arne Duncan, new CEO Ron Huberman, or Pee Wee Herman. When Mayor Daley says make a hole, you get out of the way, and you do it with a smile. Non-educator Vallas did nothing to make schools better for struggling urban youth; non-educator Duncan did less, and the new non-educator Huberman after three months on the job is on paternity leave following his announcing that he and his male partner have a baby. Real educators who previously sat in the CPS superintendent’s office did not have direct backing from City Hall. They were weak administrators that chose not to fight the CTU. They may have tried, but not one of them did anything except appear to be busy. 24MB mp3 audio file. Mitch and Don discuss the Madison School District’s $12M budget deficit, caused by a decline in redistributed tax dollars from the State of Wisconsin and generally flat enrollment. Topics include: Fund 80, health care costs, four year old kindergarten, staffing, property taxes (which may increase to make up for the reduced state tax dollar funding). Below is an update of the MMSD budget situation. The repeal of the QEO will potentially impact future settlements for salries and benefits. The decrease in funding for public education by the state creates the need for a tax increase conversation in order to sustain current programs. The decrease in the revenue limit formula will cause MMSD to face more reductions in programs and services for the next 2 years at a minimum. Last May, the Madison Board of Education passed a preliminary 2009-10 budget that maintained programs and services with a modest property tax increase. The groundwork for our budget was laid last fall when the Board pledged our commitment to community partnership and the community responded by supporting a referendum that allowed us to exceed revenue caps to stabilize funding for our schools. Two months later, with programs and staff in place for next year, we find ourselves faced with State funding cuts far exceeding our worst fears. We are in this position in part because Wisconsin’s school funding formulas are so complicated that the legislature and supporting agencies did not accurately predict the budget’s impact on school districts. State aid to Madison and many other districts was cut by 15%. In practical terms, coupled with additional State cuts of $2.8 million, MMSD is saddled with State budget reductions of $12 million this year. This grim situation is a result of a poor economy, outdated information used by the legislature, and a Department of Public Instruction policy that penalizes the district for receiving one-time income (TIF closing in Madison). Federal stimulus funds will, at best, delay cuts for one year. We are left with a gaping budget deficit when many fiscal decisions for the upcoming school year cannot be reversed. We are working on strategies and options and are looking carefully at the numbers to ensure our solutions do not create new problems. We will evaluate options for dealing with the budget in early August. To repair our budget, we are working with legislators and the DPI to appeal decisions that have placed us in this position. We continue to look for changes in resource management to find additional cost reductions. We are seeking ways to offset the impact of school property tax increases if we need to increase our levy. At the same time, we pledge that we will not pass the full cost of the cuts along as increased property taxes. We will not resort to massive layoffs of teachers and support staff, t he deadline having passed to legally reduce our staff under union contracts. I will be back in touch after our August meeting when we have made decisions on our path forward. Related: Sparks fly over Wisconsin Budget’s Labor Related Provisions. When the surgery was over, the worst of the aftermath survived, and the tumor gone, Tony Evers met with his oncologist, Linn Khuu. Evers felt a bit insulted at first. He thought he had worked hard and done good things for years. For one thing, he had been deputy state superintendent of public instruction for almost seven years at that point. Then he decided she was right. At 11 a.m. Monday, Evers, 57, will show what he is doing to make the most of it. He will be sworn in as Wisconsin’s 26th superintendent of public instruction – and almost surely the first without an esophagus. Within months of being told he had a form of cancer that generally has low survival rates, Evers decided to undertake a race for statewide office. “Once you get over a hurdle, it does make you a bit more fearless,” he said in an interview last week. “Education is all about continued improvement, and the status quo is not satisfactory,” Evers told the audience at a WisPolitics.com luncheon Tuesday at the Madison Club. In addition to guiding local schools as they navigate state cuts and an influx of federal stimulus funding, Evers is promoting a single federal test and an overhaul of accountability and assessment standards for public education. Under the new system, which Evers said would be formed quickly over the next few months, the state will be able to consistently measure other educational categories aside from test scores. The test score measurement mandates under the federal No Child Left Behind law drew criticism from Evers for their incomplete picture of education, but he said the federal standard has done educators “a tremendous favor” by showing disparities between performance of white and non-white students. Perhaps nothing will test the new state accountability system as much as Milwaukee. Evers went to great lengths to discuss the “magic” that teachers work with many less fortunate students in the state’s largest school district, but recognized a graduation rate that, despite increasing to about 70 percent, lags well behind the state average. Simply put, many of the critiques that Severson complains are not happening are in fact very much alive in school board debate, whether it comes to what needs to happen to improve the math curriculum to the reviews and changes in fiscal practice that are making it possible to close the spending gap without further trashing programs. I guess that Don was napping during the three meetings when the discussions were underway? Or, I may be wrong. This may not be a manipulation of the truth for political purposes. You be the judge – watch the video – and see whether nothing is being done on significant issues as Severson asserts. 25.3MB mp3 audio file. The discussion begins about four minutes into the audio clip. Topics include: spending, program/curriculum assessment, reading results, the District’s strategic planning process, the QEO and possible state budget changes that could raise local property taxes. Staving off a spirited run by a political newcomer, Tony Evers went from understudy to Wisconsin’s next schools chief Tuesday with the backing of the state’s largest teachers union and other professional educators throughout the state. In doing so, he beat back a challenge from Rose Fernandez, a parent advocate and former pediatric trauma nurse who tried to capitalize on discontent with the educational status quo. Evers won with the significant help of the Wisconsin Education Association Council and its affiliates throughout the state, which contributed nearly $700,000 toward his campaign. Evers credited his victory to people’s trust in his ability to help improve state schools. “People recognize that in order to make the changes necessary, we need a candidate with a broad base of support behind him, and we need a candidate with experience behind him,” he said. Evers, 57, was considered the front-runner in the race ever since he declared his candidacy in October. Budget/Financing, Community Partners, Elections, Events, School Climate, What Can I Do? Advancing Wisconsin is leafletting (and profiling voters with handheld devices) for Wisconsin DPI Candidate Tony Evers (opposed by Ruth Fernandez) (watch a recent debate), Supreme Court Candidate Shirley Abrahamson (opposed by Randy Koschnick) and Dane County Incumbent Executive Kathleen Falk (opposed by Nancy Mistele). Via Wisconsin Public Television. CTRL Click here to download the 382MB 60 minute event video, or this 26MB mp3 audio file. Rose Fernandez regularly refers to herself as an outsider in the race to become the state’s next schools chief. The implication is that her April 7 opponent, Deputy Superintendent of Public Instruction Tony Evers, is an insider who is unlikely to change what is happening with education in the state. The outsider candidate who can change things and shake up the status quo has long been a popular thrust in political campaigns. President Barack Obama, although a U.S. senator at the time, used aspects of the tactic in his campaign last fall. But some wonder whether it will have the same impact in what is likely to be a low-turnout election April 7. From her Web site address – www.changedpi.com – to frequently tying her opponent to the state’s largest teachers union, the Wisconsin Education Association Council, Fernandez appears to be trying to capitalize on one of her many differences with her opponent. But being an outsider also has some disadvantages, which Evers is trying to play up as well. At a recent appearance before the Public Policy Forum, Evers puzzled about Fernandez’s stance against a provision in Gov. Jim Doyle’s bill that he said was supported by voucher school proponents while she expressed support for voucher schools. Tony Evers today pledged to continue his long commitment to Wisconsin’s charter schools, which provide innovative educational strategies. Dr. Evers has played a major educational leadership role in making Wisconsin 6th in the nation, out of all 50 states, in both the number of charter schools and the number of students enrolled in charter schools. Evers, as Deputy State Superintendent, has been directly responsible for overseeing two successful competitive federal charter school grants that brought over $90 million to Wisconsin. From these successful applications, Evers has recommended the approval of over 700 separate planning, implementation, implementation renewal, and dissemination grants to charter schools around the state since 2001. During the past eight years, the number of charter schools in Wisconsin has risen from 92 to 221 – an increase of almost 150%. The number of students enrolled in charter schools has increased from 12,000 students in 2001 to nearly 36,000 today. Evers has also represented the Department of Public Instruction on State Superintendent Elizabeth Burmaster’s Charter School Advisory Council. The council was created to provide charter school representatives, parents, and others with the opportunity to discuss issues of mutual interest and provide recommendations to the State Superintendent. Fernandez cleaned up in traditionally Republican (but trending Democratic) Waukesha County, where she won 52 percent of the vote, to just 23 percent for Evers. It was roughly the same split in Washington County. Fernandez even beat Mobley in the other conservative’s home county of Ozaukee. Even in more Democratic Racine County, Fernandez won 40 percent to just 26 percent for Evers. Where did Evers do well? Dane County, where the deputy superintendent won more than 50 percent to a mere 20 percent for Fernandez. Of Evers’ 9,905 vote lead statewide, 7,351 votes came from Madison and surrounding communities. Evers won very big in the city of Madison, where Progressive Dane-backed candidate Price actually beat Fernandez (and came close to the frontrunner) in some isthmus wards. What’s the bottom line: Fernandez has proven herself. She is going to be a serious contender, and if she gets some national conservative money — perhaps shifting from the Supreme Court race — she could beat Evers. Of course, in a higher-turnout, bigger-spending race, a lot can change. And Evers will have plenty of union backing. But this is going to be a hot contest right up until April 7. And that could have consequences for the court race; if Fernandez turns out conservatives in big numbers, that could help Koschnick. Readers may find the 2005 DPI race worth revisiting. Audio & video here. Evers won the endorsement of the 98,000-member state teachers union, the Wisconsin Education Association Council, which paid for TV ads on his behalf. Evers was the only one of the five to pay for his own ads. Fernandez, who has often been at odds with the state education department over virtual schools, reveled in the fact that she didn’t get the WEAC endorsement, touting it as another sign of her being outside the state education bureaucracy. Fernandez was the only one of the five candidates without any professional education experience. A former nurse, she recently stepped down as president of the Wisconsin Coalition of Virtual School Families. “Some people have dismissed me as just a mom on a mission, but that’s a label I’ll be wearing as a badge of honor,” Fernandez said. She pledged to overcome WEAC’s financial backing of Evers with a broad base of support that taps into teachers, parents and students across the state. “We’re hearing that there’s a great hunger out there for our message that higher standards without higher taxes is what they want,” she said. Her campaign called for reforming the state education department, enacting changes to allow for teacher merit pay and protecting alternative education options such as virtual schools, home schooling and Milwaukee’s school choice voucher program. Evers, the deputy under retiring Superintendent Libby Burmaster for the past eight years, emphasized his 34 years of education experience during the campaign. Opponents criticized him as a status-quo insider candidate, while Evers countered he was the best-grounded to initiate reforms, particularly in the Milwaukee schools. There had been some speculation Burmaster was interested in running for governor if Gov. Jim Doyle didn’t seek re-election in 2010, but she said that type of campaign is not in her plans. She would not elaborate on her future career endeavors except to say, “I’m an education leader and I want to continue to serve in that capacity.” She also said she will get back to working in community schools with students in a “hands-on” role. 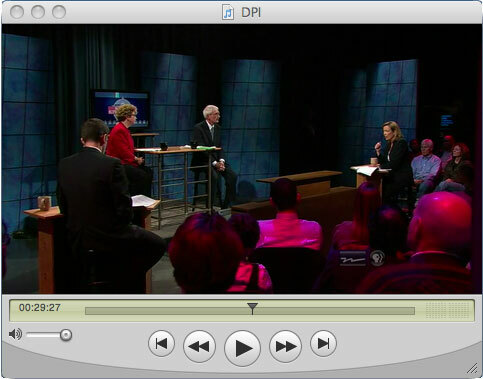 Interviews with 2005 Candidates for the Wisconsin DPI Superintendent position can be seen here. Download or listen to this 15MB mp3 audio file. Don Severson’s memo to the Madison School Board on the current financial situation. Marj Passman and Don Severson discuss school finance with Mitch Henck. In 1993, three pieces of legislation were enacted by the State of Wisconsin directly affecting school districts throughout the state. These pieces of legislation created revenue limits, created the state’s commitment to two·thirds funding, and created the qualified economic offer (QEO) in Wisconsin. Since 1993 revenue limits in Wisconsin have allowed the Madison Metropolitan School District to increase revenues annually by 2.2% on average. Conversely the QEO requires school boards to offer a comprehensive salary and benefit package to certified teaching staff of not less than 3.8% annually to avoid binding arbitration. Recognizing that the Madison Metropolitan School District’s budget is comprised of 84% salary and benefits, it must be recognized that while our revenues increase annually by 2.2%, the largest portion of our budget is mandated to minimally increase by 3.8%. Due to these competing pieces of legislation, the Board of Education since 1993 has reduced program and services by over $60 million to comply with state mandated revenue limits, of which $35 million has occurred within the past five years. Since the 1992·93 School Year the Madison Metropolitan School District has increased the total tax levy by $74,944,431 through the projected 2008·09 property tax levy. This amounts to an average annual increase of 2.56% since the 1992·93 School Year (see Attachment A). During that same time frame from 1992·93 through the projections for the 2008·09 property tax rate, the Madison Metropolitan School District has decreased the total tax rate from $20.69 to a projected rate of $9.92 for the 2008·09 School Year (see Attachment B). A look at the growth in Madison’s tax base: In 1990, the City of Madison included 40,069 parcels, a number that grew to 64,976 in 2005. Assessment and parcel growth mitigates tax levy increases, or allows it to decline (though this of course, depends on the real estate market along with tax policies). Mitch Henck @ WIBA: 15MB mp3 audio file. Marj discussed her views on US taxes vis a vis education spending versus other countries. Much more on the Madison School District’s $367M 2008-2009 budget along with the referendum. New research into what is commonly called the black-white “achievement gap” suggests that the students who lose the most ground academically in U.S. public schools may be the brightest African-American children. Disconcerting, but not surprising, said researchers who have studied achievement gaps. Studies have long shown, for instance, that African-American students are underrepresented among the top scorers on standardized tests, such as the National Assessment of Educational Progress. Fewer studies, though, have traced the growth of those gaps among high and low achievers. The reasons why achievement gaps are wider at the upper end of the achievement scale are still unclear. But some experts believe the patterns have something to do with the fact that African-American children tend to be taught in predominantly black schools, where test scores are lower on average, teachers are less experienced, and high-achieving peers are harder to find. Thanks to Jenny Root for emailing this article. Elections, Governance/Board Decision Making, School Climate, What Can I Do? Listen to the conversation, along with call-in questions: 17MB mp3 audio (about 50 minutes). Mitch Henck’s website. Much more on the referendum here. WIBA’s Vicki McKenna and Active Citizens for Education’s Don Severson discussed a variety of topics today, including Judy Newman’s series on Madison’s changing economic landscape, the Madison School District’s budget process and the planned November referendum for a new far west side school, Leopold Elementary school expansion and debt consolidation. 17MB MP3 audio.